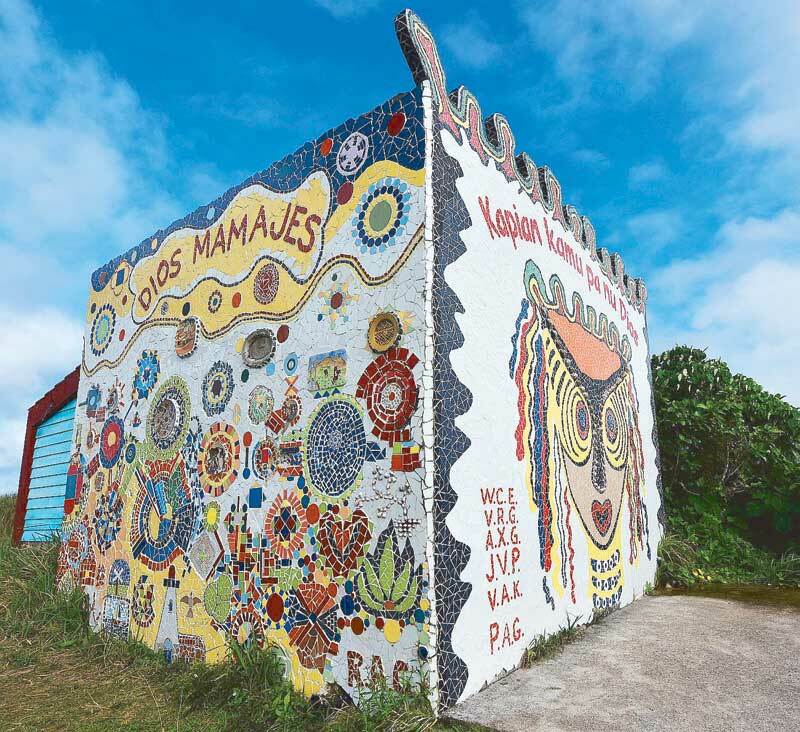 Nestled on top of a glorious hill overlooking the Pacific Ocean, Fundacion Pacita was built to honor the memory and works of internationally acclaimed Basco-born artist Pacita Abad. A line she once uttered, “I always see the world through color,” perfectly captures the grandeur and elegance of the family estate. Its nature lodge is also a museum, art space and topiary garden. All 12 rooms are named after the wind directions. We stayed in one of the Valugan or easterly wind rooms with a verandah that gave us a resplendent and unobstructed view of the Pacific Ocean. The verandah became my favorite place. In this private space, I finished reading the last few pages of Michelle Obama’s “Becoming” and perused chapters of Haruki Murakami’s “Colorless Tsukuru Tazaki.” Sitting in one of the estate’s iconic cerulean blue chairs reading or scribbling had become a cherished pre-dusk routine. The sun shying away from the horizon was a signal that it’s time to ponder what to have for dinner at Café du Tukon, home of organic gastronomic delights. During our stay, we tried different kinds of salads, with the arugula standing out as our favorite. The paco or fern salad was unavailable but we found a way to try it in a restaurant near the plaza. Well-loved breakfast fare were the fried dibang (flying fish), homemade sausage and omelet with roasted camote drizzled with honey. We also feasted on luñis (turmeric rice) with their own version of adobo and pickles on the side, plus different pasta recipes. Vegetables and herbs served in the café are homegrown. I tried the freshly picked tarragon-mint leaves for tea, served steaming hot with homemade cakes and cookies. The sweet potato bread, with chunks of chewy boiled camote, was divine. I ordered a loaf to bring home. Some parts of Fundacion Pacita are open to walk-in tourists while the well-curated museum and main gallery are accessible to in-house guests. 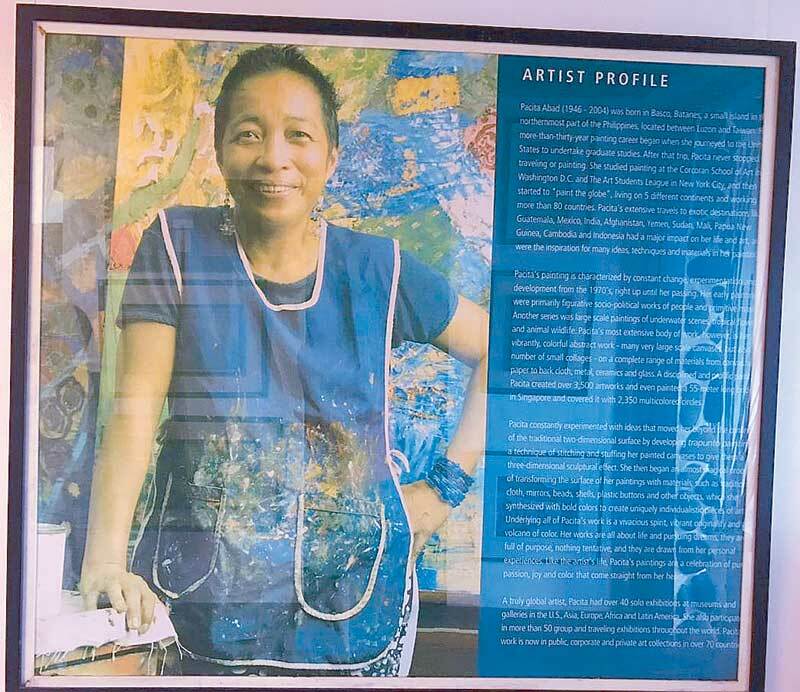 We spent mid-afternoons communing with and appreciating the art of Pacita, whose spirit is palpably present in her incredible works on display. A walk through her life – replete with interesting narratives from her days as a young political science student at the University of the Philippines until she plunged into the art scene in San Francisco, up to her decades-long adventures in over 50 countries to express her artistic prowess – adorns the main hall of Fundacion. Each stage of her life is as colorful as her works and her masterpieces perfectly resonate themes that are closest to her heart: the environment, politics or socio-cultural dimensions of a specific place or country she once lived in. I came to know more about her unique creations such as the trapunto paintings – a magical combination of various media and materials like textiles, buttons, sequins or sea shells that are painted, quilted and sewn onto the canvas. Her obras are bold, whimsical, intriguing and in a class of their own. In her strokes of genius, the contrasts find convergence. Being currently based in Jakarta, I took particular interest in the section that recounted her seven-year odyssey in Indonesia. 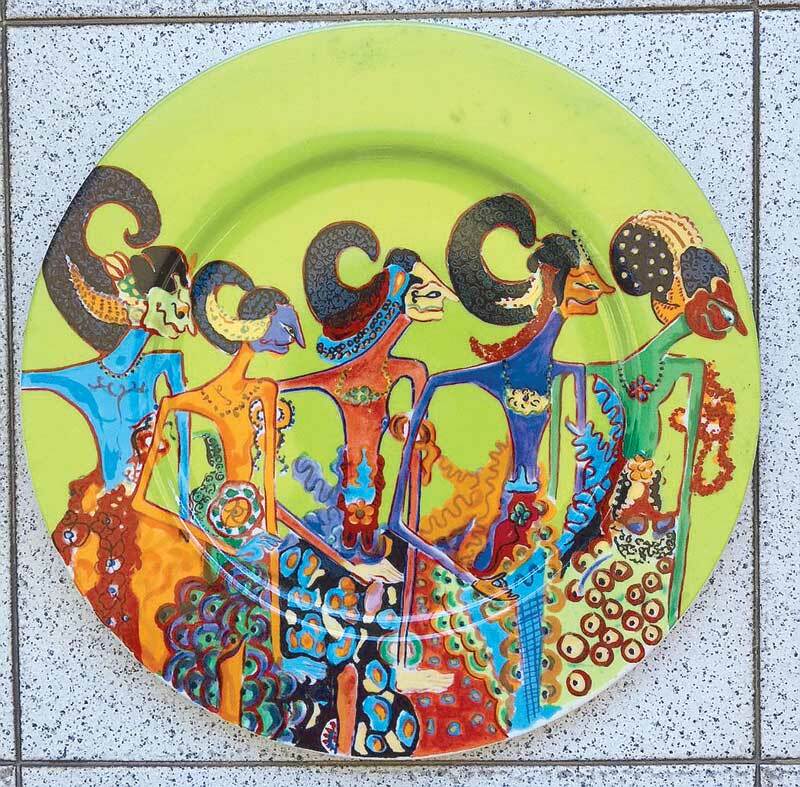 There was a narrative on how she individually painted wayangs (indigenous hand puppets) on over 100 plates, some of which decorate Café du Tukon. In Singapore, Pacita’s memory lives on through the Alkaff Bridge, which she finished painting in 2004 before she gave in to lung cancer. In her own words, the bridge is her “gift to Singapore.” As such, the psychedelic structure in the city state is also known as the Pacita Abad Bridge. 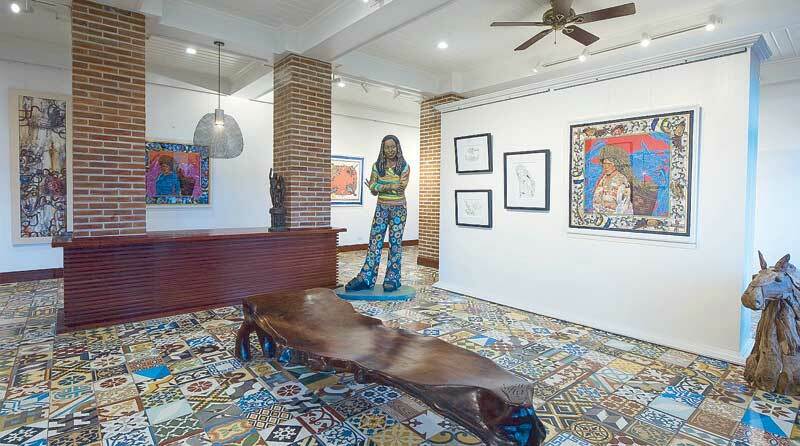 In Batanes she is most remembered through Fundacion Pacita and the Gallerie du Tulaan located at the basement level of Café du Tukon, where her larger than life flamboyant statue stands. Her bronze sculpture in the garden of Fundacion warmly welcomes guests to her home. At the gallery, there is an ongoing exhibit of Yaru nu Artes Ivatan, a group of artists from Batanes whose aim is “to help make the arts an eco-friendly industry for sustainable livelihood that supports the Ivatan culture and heritage.” The painters draw inspiration from Pacita, who I came to admire more not just for her art, her free spirit and the advocacy she advanced in her lifetime, but for her courage and indomitable strength (I read that she relentlessly worked on and eventually finished painting the enormous Alkaff Bridge in between her cancer treatments). Had she lived, perhaps she could have made it to the roster of our country’s national artists. Taking care of the environment is a recurring theme on the island. When the Ivatans speak, one could easily sense their deep respect for their domain and devotion to their heritage. After welcoming us to Fundacion, Grazielle and Ramil of the front office briefed us on the do’s and don’t’s while in the lodge and on the island. There was much emphasis on how we can help in ecotourism, gently reminding us that for the duration of our stay we are limited to a bottle of water each, which we can refill from the water dispenser. It’s one of the ways to reduce plastic bottle usage. We actually brought our own water bottles and we hardly used the room air conditioner. The chilly ocean breeze wafting from the windows plus the gentle humming of the ceiling fan were our lullaby. On our way to the town plaza we observed how clean and orderly the roads were. Ton our driver was quick to add that garbage is strictly segregated and placed in designated areas only. He spoke of how he now appreciatively works at Fundacion and how he’s starting to learn to farm. In Batanes, everyone is a farmer – doctor-farmers, teacher-farmers or tour guide-farmers are common. A statue of Pacita stands guard at the Gallerie du Tulaan. Jun, on the other hand, owner of JRG Tukun Travel and Tours which efficiently handled our tours, shared how he used to work as an auto mechanic then became a driver at Fundacion Pacita. In the course of his driving duties, he tagged along with tour guides as they showed tourists around, attentively listening to their spiels and eventually learning from them. Encouraged by the management of Fundacion, whom he spoke highly of, Jun attended seminars sponsored by the Department of Tourism and the local government to learn the intricacies of running a travel agency and ecotourism as a whole. He was pleased to share his views and dedication to help preserve their beloved Batanes amid the influx of tourism. And it’s not just him, it’s a shared commitment because tour guides and volunteers dedicate first Saturdays of the month for coast and site cleanups. That quiet dignity of the Ivatans and their reverence for their environment and heritage made us love Batanes even more. Strolling idly along the plaza on our first day, we were endeared by the people’s genteel smiles and politely shy nods, perhaps their way of greeting us, “Welcome to our town.” It was the same warm gesture we felt as we bade everyone so long and said, “Dios mamajes” (thank you in the Ivatan language or, literally, may God reward you with goodness) to those we encountered during our stay. For a few more unhurried minutes before leaving, I inhaled as much fresh air as I could, scanned the spectacular surroundings then closed my eyes to make sure I stored each of the minutiae in my memory.